The latest edition of Knit Today has hit the shelves and it is safe to say I was probably first in line as usual to pick it up! Issue 106 is packed with so many festive ideas and delights, I swear you will find it difficult to decide which of the 42 beautiful patterns you want to knit first! One of my favourite things about this issue is the Advent Calendar pattern. Then again, it is an obvious choice for me when I get to combine two of my favourite things - knitting and chocolate! As with all their other issues, we get a free gift! Another reason why I love this magazine! This month we have a fabulous, overly cute "Tom the Teddy" pattern to try out. We also get the wool to make the teddy - bonus points to you, Knit Today! So what are you waiting for! Go out and get your copy today and you can be sure it will soon get you into the Christmas spirit! Do you try to combine knitting with other crafts such as crocheting? 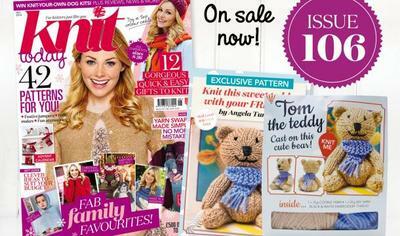 Do you rather knit/crochet with rich, vibrant colours or more relaxed, pastel colours? Have you ever held an alligator snapping turtle?